Terrace/balcony gardening during the summer of 2016 was the best of the sixteen years that I have lived in my condominium in the heart of the city. The number of days of full sunshine and the high temperatures provided excellent growing conditions, as long as the plants were well watered. Fortunately, I have an automatic watering system that was purchased at Canada Blooms several years ago for less than $200. I do not know if the distributor remains in business. The system was manufactured in Australia. In previous years, by mid-August the blooms became more sparse as the plants had completed their growing cycle for the season. However, this year, it did not happen until almost the middle of September. The summer 2016 will forever be engrained in my memory as one of the best for terrace gardening I have ever experienced. View of the terrace from inside the apartment on September 1, 2016. The awning protects the terrace from the extreme heat of the sun as I have a southern exposure. View of the west side of the terrace. It is 200 square feet, although the photo tends to exaggerate its size. The decking is plastic that resembles cedar wood. I have found it to be more practical than the pine flooring that I previously had, as the plastic has not warped or faded during the six years since it was installed. Also, the plastic squares can easily be lifted to clean underneath them, where soil and leaves tend to gather. View of the east side of the terrace. The potted plant on the table is coleus. I wintered the coleus last year, so this is the second summer for the plant. The red blooms are impatiens, flowers that I have not planted for many years. However, they were very successful in 2016 and I will plants them again next year. They were tolerant of full sun as well as partial shade, as long as they were watered regularly (morning and evening). Marigolds planted in front of zinnias worked well, as the zinnias grew taller. The zinnias are ideal plants for large pots or boxes as they bloom constantly and each bloom lasts for at least three weeks. In the above photo, there are only two zinnias, a red and a yellow, as they multiply quickly. I noticed brown spots on the leaves of them in mid-August. I learned that they were caused by heat stress, rather than a fungus. By mid-September, the blooms on the zinnias began to disappear and the plants became stringy. However, the marigolds soldiered on in full bloom. Marigolds and zinnias in late-August. Sweet alyssum creates a bountiful border, hanging down over pots and boxes. However, it requires full sunlight for at least 6 hours a day. The rosemary is in a plastic pot that has had the bottom cut out. I bury it each spring in the large planter box, as this allows the roots to expand down into the soil. Each November, I remove the pot from the planter box, cut off the roots, trim the branches, and bring it inside. I have done this procedure with this particular plant for ten years or more. It is similar to “bonsaing” the plant, as its branches become twisted and gnarled, and the plant remains small. It is perfect for an indoor supply of rosemary during the winter months. I reserve a corner box for herbs—sage, mint, garlic chives and tarragon (perennials only). The only herb I purchase each year is basil. As previously stated, I have rosemary all year. Engleman ivy and clematis in July, on the east wall. In the sixteen years I have lived in the apartment, the growth of the engleman ivy on the east side of the terrace has never been so prolific. Despite constant pruning, the growth extends almost a metre out from the wall. It is fast growing and very invasive. Photo taken on September 18, 2016. It has also been a great year for basil and tomatoes. The east side of the terrace in July, 2016. The hose is on the floor in the corner of the terrace. This is the only summer that I have been forced to supplement the automatic system with an extra mid-morning watering. The seating area of the terrace, looking west, the greenery surrounding the sitting areas and the plastic decking on the floor—September 2016. This maple tree grew from a seed that blew onto the terrace in 2015. I transplanted it to this location and trimmed it regularly. However, despite my efforts, it has become too large and blocks the light from the plants to the right of it. Unfortunately, I must pull it out at the end of the season. East view of the terrace and the CN Tower. A link to view a post about the terrace in 2015. The October 2016 issue of Toronto Life magazine features an article on the recently published book by Doug Taylor about Toronto’s old movie theatres. Toronto Life states that it is “. . . a charming catalogue of the city’s oldest cinemas … [and] recounts fascinating stories from some of his favourite theatres . . . ” Published by Dundurn Press, the book “Toronto’s Movie Theatres of Yesteryear—Brought Back to Thrill You Again” explores 81 theatres and contains over 125 archival photographs, with interesting anecdotes about these grand old theatres and their fascinating histories. 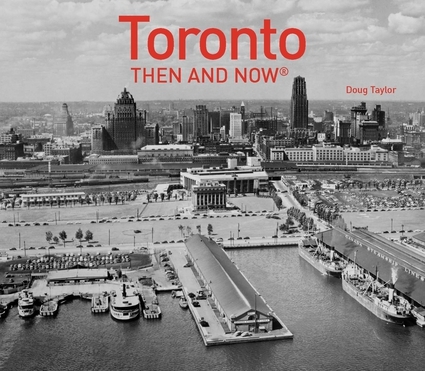 “Toronto Then and Now,” published by Pavilion Press (London, England), is a coffee-table style book that explores 75 heritage sites in Toronto and illustrates how they have changed throughout the decades. The photos are large, many occupying a full page, and because they are opposite each other, comparisons are easier and more dramatic than in other formats. Each photo is accompanied by a brief text that informs readers of the history of the sites, and includes interesting anecdotes. Most of the archival photos are from the Toronto Archives, and the modern photos were taken by Karl Mondon. Below are a few of the heritage sites that are featured in the book by Doug Taylor. (Left) Toronto ferry the Trillium in 1934, and (right), the Trillium in 2015. (left) The east gate of Fort York in 1909 and (right), the same view of the fort in 2015. The CNE Princes’ Gates in 1929 and (right), the gates in 2015. View of the CN Tower, gazing west on Front Street in 1973, and (right,) the same view of the tower in 2015. (left) The Church of the Redeemer at Bloor St. and Avenue Rd. in 1924, and (right), the same view in 2015. Another book on theatres, published by Dundurn Press, is entitled, “Toronto’s Movie Theatres of Yesteryear—Brought Back to Thrill You Again.” It contains 75 theatres, accompanied by over 125 archival photographs. The text relates interesting anecdotes about these grand old movie houses and their tells about their fascinating histories.